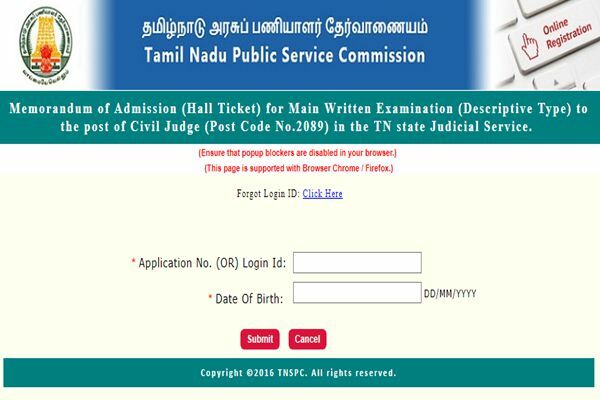 TNPSC Civil Judge Main Hall Ticket 2018: Tamil Nadu Public Service Commission (TNPSC) has scheduled the civil judge Main written test on August 2018. Hence aspirants applied for the Civil Judge posts can download TNPSC Civil Judge admit card to proceed with the examination. The hall ticket/call letter/admit card will be accessible to download on TNPSC official portal, tnpsc.gov.in. By visiting the portal, candidates can download their respective admit cards. All the applicants can download and keep the admit cards safely to carry forward with the examination. The Civil Judge written test will be held in various places across Tamil Nadu. After downloading the hall ticket, applicants can check the details on their examination centre. Check more details such as downloading process, admit card release date, guidelines for the examination and other details from this article. Tamil Nadu Public Service Commission shortly known as TNPSC annually announces various recruitment notifications for the state level Government jobs. Aspirants seeking to get state government jobs can keep checking the TNPSC official portal for latest job notifications. The TNPSC has recently come up with the job notification for 320 Civil Judge positions. Many of the suitable aspirants have applied for the announced posts during 9th April to 9th May. Aspirants who have applied for the Civil Judge posts will be selected through 3 various rounds, preliminary examination, mains examination and interview rounds. Candidates clearing each one of the rounds will be sent to the successive round. Hence all the applicants have to appear for TNPSC Civil Judge preliminary examination first. The examination is scheduled on 9th June. Hence all the applicants who have applied for the posts of Civil Judge can download hall ticket before 10 days of the examination (approximately). TNPSC Civil Judge hall ticket 2018 will be accessible to download from tnpsc.gov.in. Candidates will be shortlisted through preliminary examination, mains examination, and interview rounds. The TNPSC is going to conduct the preliminary examination on 9th June for all applicants. Hence all the applicants can get ready to face the examination by downloading the TNPSC Civil Judge Preliminary Exam Hall Ticket, which is going to be released before 10 days of the examination. Soon after the release of hall ticket, candidates can download and check the details of their examination venue, date, and timings from it. Also, applicant’s details such as name, date of birth, father’s name, signature, scanned photograph etc will be mentioned on admit card. After downloading it, candidates can clearly check all details once. If any spelling mistakes were there on admit card, candidates can contact the TNPSC authorities through email, or helpline numbers. Search an appropriate link of TNPSC Civil Judge Exam admit card 2018.